My journey as the flying doula started with yoga, not just because that was the first time I held the space for others' growth, but because I never would have discovered aerial arts, or doula work if I hadn’t met the people yoga led me to. The teachings of yoga: staying present in your body, and in the present moment, and the tools of yoga: breath, movement, and meditation, are very much the foundation of Flying Doula. As much as I love both aerial arts, and yoga, aerial yoga was a natural fit for my next evolution. In the Fall of 2014, I was hired to help establish the curriculum and style of a new aerial yoga studio in Shanghai, China. For a month, I taught more than a dozen aerial and vinyasa classes a week, along with aerial conditioning, aerial restorative, and aerial dance workshops. It was an incredible learning experience that pushed me to further develop my skills as a teacher, space-holder, and supportive collaborator, and I brought those new skills back to my classes in New York. Two years later, I started teaching aerial silks classes as well, and in 2017 I began performing aerial silks, and other apparatuses professionally. Most recently, I've begun teaching lyra, and single point hammock. 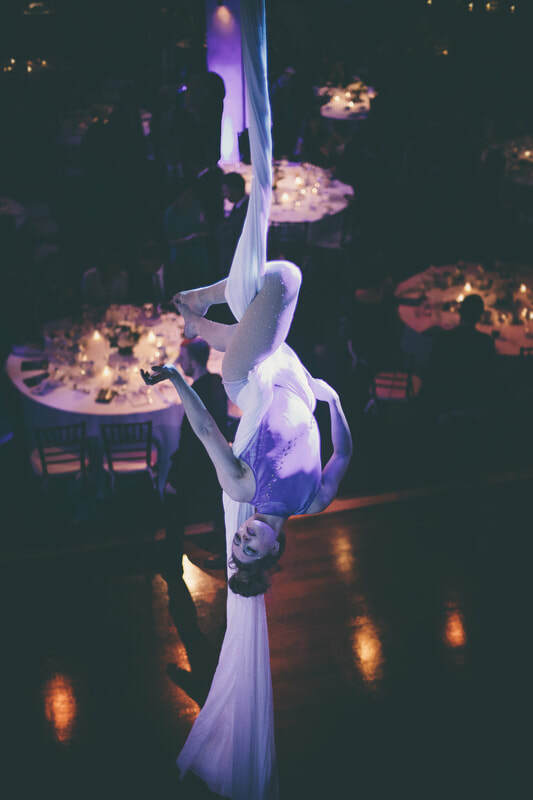 Performing ambient aerial silks at the French American Chamber of Commerce Gala. Photo by Flaviu Nasarimba. Finally, I felt ready to answer the call that had been growing in me since 2012 to become a birth doula, changing birth culture, and supporting birthing people one family at a time. ​Becoming a doula was a natural extension of my work as an aerial yoga and aerial arts instructor: working with circus students has taught me so much about holding the space for others to find to find their own power. I trained with DONA International, and after over a year of hard work, serving clients, and continuing education, I received my certification from DONA as well. For me, the choice to be a doula is an important part of my feminism. The oppression of birthing people is rooted in misogyny, but it’s important to remember that not only (and not all) women give birth. I support people of all genders, including none at all, to take back their power, and make the choices that are right for them surrounding their reproductive health, prenatal care, birth experience, postpartum period, and parenting. In 2018, I combined my skills to adapt the aerial yoga hammock to provide support and greater freedom of movement to people in all stages of pregnancy and postpartum, creating prenatal and postpartum aerial yoga. ​Most recently, I've begun taking my passion for ethical and sustainable eating and cooking into my practice, offering collaborative cooking and meal-prep lessons and sessions to my clients. In all my pursuits, whether it's performing ambient aerial at a beautiful event, massaging a laboring person's hands, helping a new student into their first foot lock, or collaborating with a client on interpreting a challenging tarot card, I love holding the space for others to look within, and discover what they're capable of moment to moment with beautiful boldness, and deep compassion. 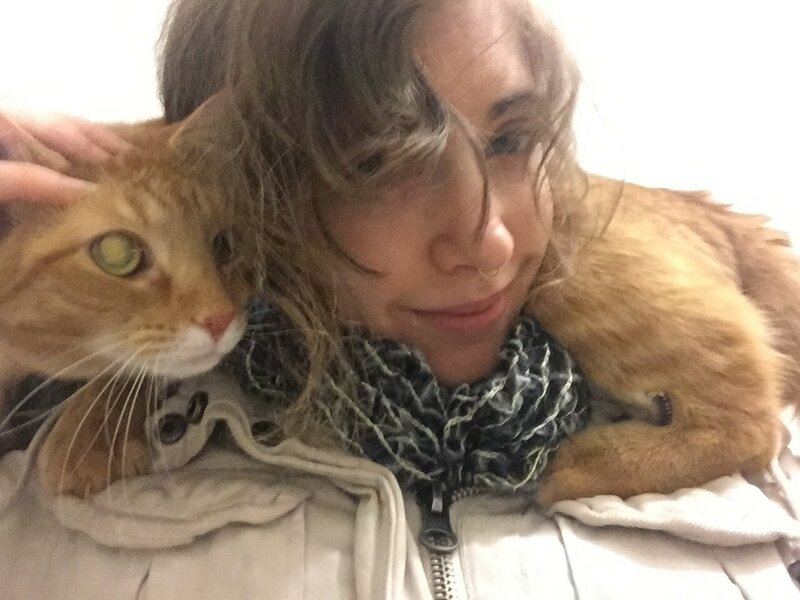 I live, laugh, and love in Brooklyn with my husband, two cats, a rotating cast of foster cats, and numerous plants. Read more testimonials on my profile at doulamatch.net. ​When I decided to have a doula, I reached out to a few girls that I thought had a profile fit for me and for what I wanted. Emily was the first one I interviewed and even though I still had other people to meet I knew immediately she was the one I wanted to have with me in my journey of childbirth. She is so sweet and knowledgeable, she had answers to all my questions, she kept me grounded, helped me get through my anxieties with objective solutions and the most positive attitude I’ve ever seen. Every time I had a question or a fear I would text her and she would answer right away with great insight and strong science to back her up. Unfortunately my birth plans did not go as intended, but Emily was there every step of the way, encouraging me, helping me cope with the physical and emotional distress, always with a positive attitude. I don’t think I could’ve gone through what I went through without her help. If I have another child I will definitely have her as my doula again. "My daughter Katie recently had her first child, and decided to try a home birth. She got in contact with Emily Hursh who offers services as a doula. I was fortunate enough to be present during the labor at my daughter's home, and later at the hospital when the home birth stalled and a transition had to be made. Emily was very active and engaged through the process, first working directly with Katie in a genuine and caring way, and later actively helping to make a smooth transition to the hospital. During this time she was also quite helpful to me: explaining what was going on and keeping me informed when I wasn't present. She is an excellent communicator and very knowledgeable about birthing procedures and strategies. I would highly recommend her if you are considering a doula for the birth of your child."